If you have friends coming over for dinner, wow them with an all-in-one delicious fondue. As we head into the cooler months, you might love the idea of having friends over for a nice night in. Trust us when we say gathering around the table for an oozing, golden pumpkin fondue is a sure-fire way to get the conversation started and bellies full. This recipe is fairly easy, however, make sure you allow enough time for the pumpkin to roast before guests arrive. Then when everyone is ready all you have to do is make the cheese fondue and finish it off in the pumpkin, in the oven. Clean the outside of the pumpkin and dry off. Slice the top of the pumpkin to create a lid. Remember to cut higher up so that you have a good-sized bowl at the bottom. 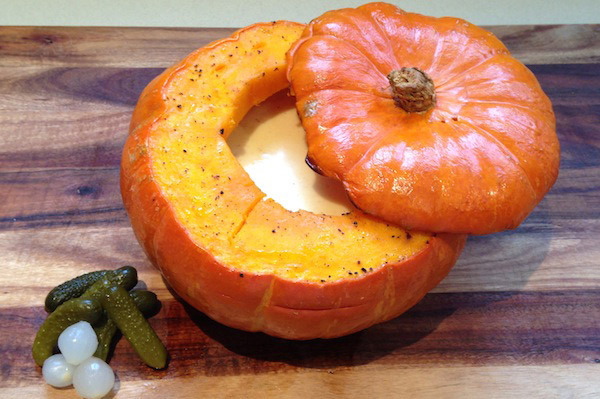 Scoop out the inner pumpkin (seeds etc) and create a round “inner bowl” that will hold the cheese fondue. Rub olive oil on the outside of the pumpkin and the pumpkin lid. Coat the inside of the pumpkin with more olive oil and some salt and pepper. Put the lid back on the pumpkin. Place the whole pumpkin in a roasting bowl or deep tray and put in the oven for 40-60 minutes or until the thickest part inside the pumpkin is about 3/4 of the way to done (test with a skewer or small knife). Remove from the oven and set aside. To make the cheese fondue, grate or small dice all three cheeses and leave in separate piles. Sprinkle the cornstarch over the cheeses. In a medium-sized pot over a low-medium heat add the wine and bring to a gentle boil, add the garlic. Add the gruyere cheese first, a few handfuls at a time, and stirring until smooth. Then do the same for the tasty cheese, followed by the provolone cheese. Stir to ensure it is smooth and add the nutmeg, gently pour in the cream. Remove from the heat and stir. Pour the cheese mix into the pumpkin and pop the lid back on. Place back in the oven for another 20 minutes, until everything is warmed through and the pumpkin is tender. Remove from the oven and serve immediately with a selection of baguette slices, cornichons (small pickles) and cocktail onions.